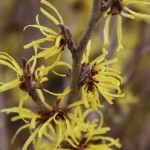 A compact, upright shrub with lightly fragrant, clear yellow flowers in the late winter to early spring. The new growth emerges yellow green, with some purple tints. The fall foliage color is yellow with orange highlights. It prefers full sun to part shade, with the best flowering in full sun. It needs an average, well-drained soil. Prune after flowering as needed for size and shape.